Summary: A new mathematical formula based on the rhythmic movement of a sperm could provide new insights into male infertility. Researchers have developed a mathematical formula based on the rhythmic movement of a sperm’s head and tail, which significantly reduces the complexities of understanding and predicting how sperm make the difficult journey towards fertilising an egg. Researchers at the Universities of York, Birmingham, Oxford and Kyoto University, Japan, found that the sperm’s tail creates a characteristic rhythm that pushes the sperm forward, but also pulls the head backwards and sideways in a coordinated fashion. 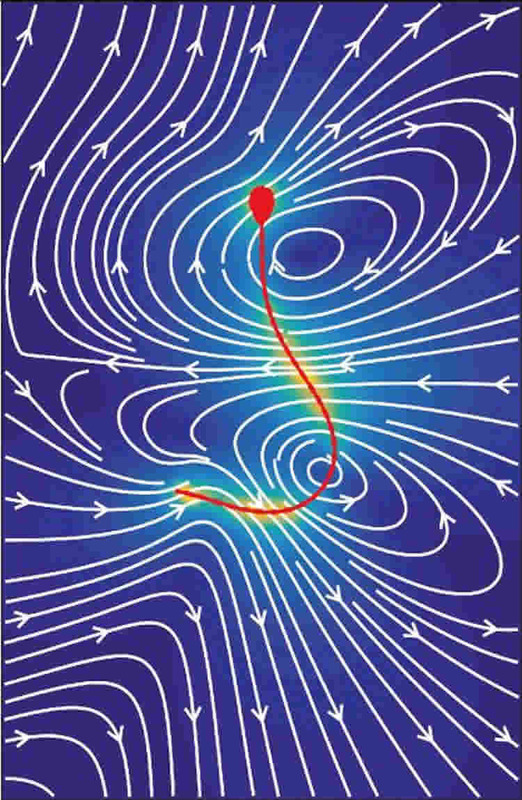 Sperm stirs the fluid around in a very coordinated way locomotion, not too dissimilar to the way in which magnetic fields are formed around magnets. NeuroscienceNews.com image is credited to Kyoto University. Dr Hermes Gadêlha, from the University of York’s Department of Mathematics, said: “In order to observe, at the microscale, how a sperm achieves forward propulsion through fluid, sophisticated microscopic high precision techniques are currently employed. “Measurements of the beat of the sperm’s tail are fed into a computer model, which then helps to understand the fluid flow patterns that result from this movement. “Numerical simulations are used to identify the flow around the sperm, but as the structures of the fluid are so complex, the data is particularly challenging to understand and use. Around 55 million spermatozoa are found in a given sample, so it is understandably very difficult to model how they move simultaneously. Dr Gadêlha said: “It is true when scientists say how miraculous it is that a sperm ever reaches an egg, but the human body has a very sophisticated system of making sure the right cells come together. “You would assume that the jerky movements of the sperm would have a very random impact on the fluid flow around it, making it even more difficult for competing sperm cells to navigate through it, but in fact you see well defined patterns forming in the fluid around the sperm. Image Source: NeuroscienceNews.com image is credited to Kyoto University. Original Research: The study will appear in Physical Review Letters. University of York “Mystery of How Sperm Swim Revealed in Mathematical Formula.” NeuroscienceNews. NeuroscienceNews, 20 March 2017. University of York “Mystery of How Sperm Swim Revealed in Mathematical Formula.” http://neurosciencenews.com/sperm-swimming-math-6265/ (accessed March 20, 2017).